While he might strike most people as a reserved person, Nomura's research analyst Sai Min Chow thinks interacting with people may be the single most important thing an analyst should do. "I used to think if you are very good with numbers, you're sceptical, you're good with the models, you're good at writing, you may make a good analyst. But actually I think the most important thing ... is actually the people whom you work with," Mr Sai said. "There will always be angles that you have not thought of, things that you miss. But a person from another angle, particularly somebody who's experienced enough and is willing to share, he or she will be able to tell you and point it out to you," he added. This is perhaps the winning formula for Mr Sai as he was named top real estate earnings estimator of the StarMine Awards. 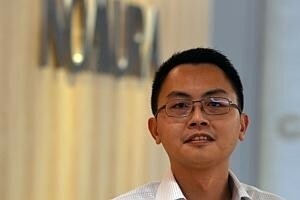 He earned a five-star rating on his estimates for UOL Group and CapitaLand. In 2011, he was also No. 1 stock picker for the sector. For this, Mr Sai said he has five persons to thank: Kevin Scully of NetResearch who first hired him; Nomura's former head of sales Jenny Chiam; his mentors at Nomura, namely South-east Asia's head of equity research Lim Jit Soon, former head of property research for Asia-Pacific Paul Louie, and Tony Darwell, former head of South-east Asia property research. Mr Sai joined Nomura in 2008 from the now-defunct investment bank Lehman Brothers after Nomura bought the latter's European and Asian operations. The 34-year-old started his career at NetResearch Asia in 2005. Explaining some of the trends he saw in the property sector over the past year, Mr Sai said there was a lot of exuberance in the market at the start of the year, particularly towards real estate investment trusts (Reits). A succession of cooling measures, a new debt servicing framework and fears of a potential liquidity outflow due to US Federal Reserve tapering have set nerves on edge in real estate circles. "This year, one of the surprises is that Reits will underperform the market. When we came out with our report in January, the Reits were flying. Now, I feel that there's some ground to say that people are already quite cautious about the developers, and getting quite cautious about the Reits." Having said that, Mr Sai still sees pockets of opportunities in investing in Reits, as not all of them would see the same impact of an interest-rate increase. Those that were penalised for having a higher cost of borrowing previously will be less affected when interest rates increase. As for the property developers, Mr Sai said investors can choose to go for those with less exposure to the Singapore residential market and those with a diversified portfolio. "The one that comes to my mind is CapitaMalls Asia. It has nothing to do with the Singapore residential market, but is basically corrected with the rest of the market."